“As a result of climate change, population growth and rising expectations regarding quality of life, energy requirements for cooling processes are growing much faster worldwide than for heating. Another problem that besets today’s refrigeration systems is that most coolants cause environmental and health damage. A novel technology could provide a solution: refrigeration using magnetic materials in magnetic fields. 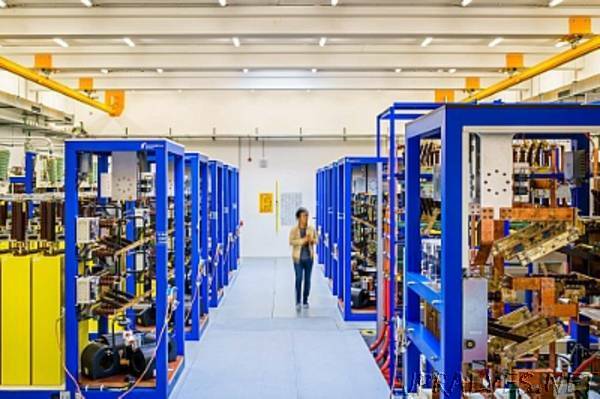 Researchers at the Technische Universität (TU) Darmstadt and the Helmholtz-Zentrum Dresden-Rossendorf (HZDR) have developed the idea of a cooling cycle based on the ‘magnetic memory’ of special alloys. Relevant initial experimental results have now been published in the journal ‘Nature Materials’ (DOI: 10.1038/s41563-018-0166-6). The project is funded by the European Research Council (ERC). In the next step of the six-step cycle, the researchers removed the cooling element from the magnetic field, which retained its magnetization. In step three, the heat sink comes into contact with goods to be cooled down and absorbs its heat. It even remains magnetic if the material returns to its original temperature. This can be remedied by mechanical pressure: in step four, a roller compresses the shape memory alloy. Under pressure, it switches to its denser, non-magnetic form and heats up in the process. When the pressure is removed in step five, the material retains its state and remains demagnetized. In the final step, the alloy releases heat into the environment until it has returned to its initial temperature and the cooling cycle can recommence. “Just a few years ago, alloys with a magnetic memory were regarded as unusable because they can only be cooled in the magnetic field once,” explains Gutfleisch. “Global research therefore focused on materials that have no memory effect. However, refrigerators produced according to this principle come at a price.” The largest item in the manufacturing costs are the necessary permanent magnets: “In the case of reversible magnetization, the cooling effect only lasts as long as the cooling element is exposed to the magnetic field. Even in the best-case scenario, half of the coolant must be placed between the magnets. This means that you need four times as much permanent magnet as cooling medium.” Neodymium magnets are the most effective, but they are also the most expensive on the market. In addition, the rare-earth metal is a critical raw material, and considerable amounts of it are needed. The largest known deposits are in China, and its extraction causes considerable environmental pollution. Oliver Gutfleisch is also convinced that the future belongs to solid coolants. “We have been able to show that shape-memory alloys are highly suitable for cooling cycles,” says the functional materials expert: “We need far fewer neodymium magnets but can nevertheless generate stronger fields and a correspondingly greater cooling effect.” By 2022, he intends to build a demonstrator at the TU Darmstadt that makes it possible to estimate both the actual cooling capacity under real-life conditions and the energy efficiency of the process. For this he has received an ERC Advanced Grant from the European Research Council worth a total of 2.5 million euros over five years. The collaboration between the TU Darmstadt and the HZDR could help make the principle suitable for mass use: “In the meantime, we have found alloys that combine all the desired properties, including a large magnetocaloric effect, without using any rare earths or other critical raw materials at all,” says Tino Gottschall, who wants to explore the physical limits of these materials at the HLD.